The pulp chamber or dental pulp is characterized by the soft place within the tooth’s centre. The nerve of the tooth is situated within the tooth’s root canals, which are situated within the roots of the tooth. The nerve of a tooth is not vital to the health a tooth and works after the emergence of tooth through the gums. It provides the sensation of cold or hot. However, the absence or presence of a nerve doesn’t affect the daily functioning of your tooth. 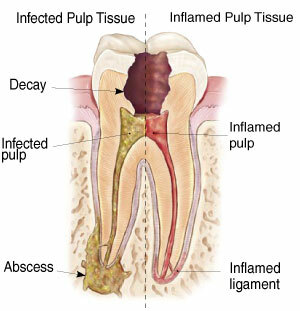 When the pulp or nerve tissue of your tooth is damaged, bacteria start to multiply and grow within the pulp. The bacteria as well as certain other decayed debris can cause an abscessed tooth or infection. Abscess tooth is a pus-filled pocket which takes place due to the spread of infection to the end of the tooth’s roots. The pulp or nerve of a tooth can become inflamed, infected and irritated due to large filling, repeated dental procedures, face trauma, deep decay, a chip or crack in the tooth. Visit a specially trained dentist at Brighton Implant Clinic if you notice any of these symptoms. For more information please feel free to Contact Brighton Implant Clinic or Call us on 0800 111 6623 .